Should you see a physiotherapist after low back disc surgery? Presenting the evidence. – Pain. Health. Exercise. Should you see a physiotherapist after low back disc surgery? Presenting the evidence. The amount of people undergoing surgery for lower back disc problems is tremendous. Surgery rates vary across countries. In the Netherlands, with a population of about 16 million people, it is estimated that about 12,000 operations for herniated lumbar discs are performed each year. In the UK, lumbar disc excisions were performed 9694 times in 2011-2012 in National Health Service (NHS) hospitals that serve an estimated English population of 53 million. In the United States—population about 287 million —an estimated 287,122 lumbar discectomies were performed. Based on best practice guidelines, elective low back surgery is recommended when one has persistent symptoms of low back-related nerve dysfunction that has failed conservative treatment (medication and/or physiotherapy). 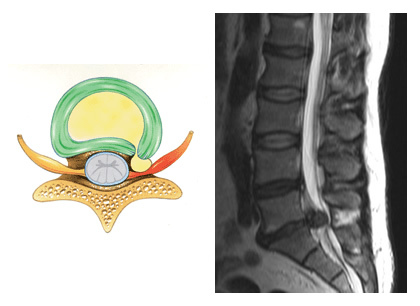 A lumbar L5/S1 intervertebral disc herniation. 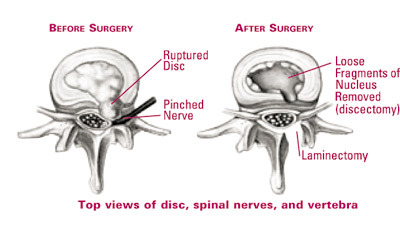 Of all types of low back surgeries to correct disc pathology, lumbar disectomy is one of them. As of now, the latest update of the Cochrane review paper published in 2014 has summarised all randomised controlled trials concerning physiotherapy after lumbar disc surgery. A randomised controlled trial (or RCT) is a type of scientific (often medical) experiment, where the people being studied are randomly allocated one (intervention group) or other (control group) of the different treatments under study. The RCT is often considered the gold standard for a clinical trial. In medicine research, placebo (sugar pills that has no intended effect in the study) is often the control group. Therefore, it is able to test the effectiveness of the intervention against ‘doing nothing + placebo effects’. However, it is often difficult to offer ‘sugar pills’ in physiotherapy research. Imagine that you are a subject randomly allocated to the ‘control group’ in a physiotherapy research trial: there is a likelihood that you know that you’re in a ‘control/placebo’ group if your treatment consists of ‘doing nothing for 4 weeks’, knowing that the research is all about ‘the effects of doing something‘. Therefore, many physiotherapy research done are not tested against ‘sugar pills/placebo’ but tested against another intervention. This is not a controlled trial but a clinical trial. What do we know from the review paper? A summary of this review paper can be read here. There are insufficient good studies published on this topic to give a conclusive statement. But at least we know we are on the right track! What a shame! Well, if you look at individual studies that were being included in this review, there is hope that physiotherapy after lumbar disectomy surgery will lead to improved outcomes in the short term. Because the current evidence for physiotherapy is low to very low, any new impactful study will greatly change recommendations for clinical practice. There are many reasons why the evidence is low to very low and most likely will remain this way. One of the reason is that many physiotherapy research are cross-sectional studies, which is of a lower quality than an RCT. Of the trials reported on physiotherapy that started four to six weeks after surgery (5 studies with a combined 272 participants only), it has been shown that exercise programmes are more effective than no treatment in terms of short-term follow-up for pain, 4 studies (with a combined participants 252) favour exercise programs for improved functional status on short-term follow-up. A higher intensity exercise program is favoured (2 studies with a total of 103 participants) for pain relief and improved function in the short term. In research lingo, short term usually means 6 months. Studies point towards no difference in the long term for pain and function. In research lingo, ‘long term’ means more than 12 months. Ask yourself: would you like to maximise your physical function in 6 months or in 1 year’s time? The answer is very simple! Seven studies specified adverse events, and none of those studies reported that physiotherapy increase the re-operation rate. Post-operative physiotherapy is safe and does not increase the chance of re-operation. The authors’ conclusion is supported by a paper published by Carragee in 1996, that stopping post-operative restrictions after limited discectomy resulted in shortened sick leave without increased complications. There is no reason to restrict your physical activities with the fear or a relapse or re-operation. As I mentioned in the disclaimer, there will be a high risk of bias in this, as we cannot control how healthcare professionals advice patients. Consider physiotherapy research other than only randomised controlled trials. A recent paper (cross sectional study) published on 600 subjects who were followed for 2 years after total lumbar disc replacement surgery showed significant improvements in their pain, function and quality of life with physiotherapy intervention. In fact, the group that attends equal or more than 4 sessions did the best out of the 3 groups (those who did not attend and those less than 4 sessions). Although lumbar disectomy and replacement surgeries are very different, physiotherapy after surgery share many similarities. In disc replacement surgery, physiotherapy seems to improve outcomes! What you have been told will significantly affect how you live your life after surgery. In my opinion, the word of the healthcare professional is extremely important. 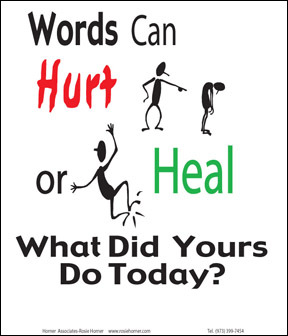 Words can heal and harm at the same time. From anecdotal evidence, it seems like working with clients who were provided with reassuring advice from their surgeons after spinal surgery tend to be the group that are more positive about their future and more willing to return to their previous activities via physiotherapy. We need to start patients moving the safe and right way as early as we should, because most people do not know how much to move after their operations. In addition to this, anyone who goes ‘under the knife’ (surgery) will definitely experience downtime due to reduced strength and mobility while recuperating from surgery. 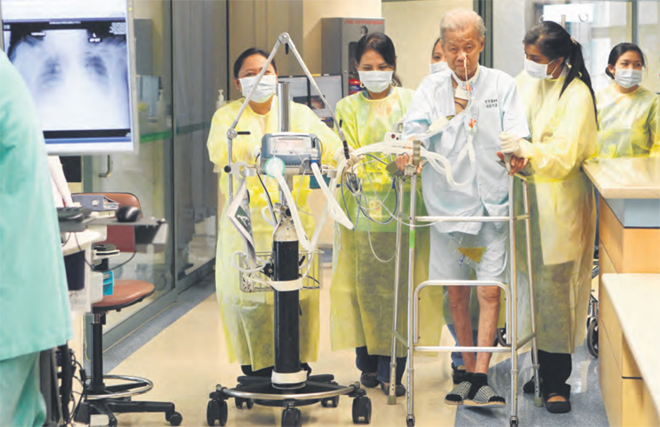 The days when patients are being prescribed bed rest to recuperate is gone, and even the practice of physiotherapy early mobilization of patients in the Intensive Care Unit (ICU) is based on good robust medical evidence. Even the most sickly people in the hospital improve with physiotherapy, why not the group after spinal surgery? The day that exercise and movement doesn’t help you would be either your bone broke, or the time you breathed your last breath. Exercise helps to change your poor movement habits, improve strength and range of motion, improve mood and spirits after surgery. Physiotherapy provides an intervention to improve physical strength, movement and function, so I cannot see why physiotherapy should not benefit anyone who had a lumbar disc surgery, provided all precautions are taken care of. Disclaimer: You should not use the information here as your treatment protocol. Always seek your surgeon’s advice as he is the primary healthcare provider that has operated on you and understands the strength and stability of your spine. However, it is likely that there may be a high percentage of bias in terms of his opinions due to the lack of “best-practice” medical guidelines in this area. What I intend to do is to present the research evidence to answer the questions that most people face after a spinal surgery. 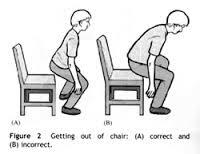 Previous Post Should you be worried about ‘cracking’ your joints? Next Post Standard Chartered Marathon 2015: 5 & 6 December 2015.